Chicago Pneumatic is premiering its new range of cordless tools for the vehicle service industry at SEMA 2014, booth 10102. Visitors to the booth will be able to try the tools and see first-hand just how powerful and easy to use they are. The company is also previewing its workshop equipment range, which will be available in 2015, as well as showcasing new tools in its pneumatic range of impact wrenches. Chicago Pneumatic’s new range of cordless tools, which includes impact wrenches and drivers, provides the operator with more power and a runtime which is twice that of conventional products. 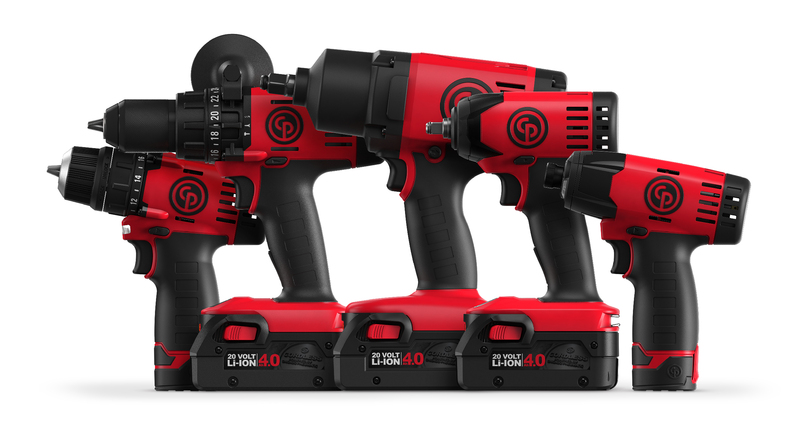 The advanced technology of the 20-Volt/4Ah CP20XP and 12-Volt/1.5Ah CP12XP Lithium-ion batteries means the tools deliver the power and performance of an air tool while providing the mobility of a battery tool. They offer superior power and battery performance for increased productivity, durability, ease of use and mobility. On the booth the company will also be showing its new air tools including: the CP7748TL ½” composite Torque Limited impact wrench which is an ideal tool for everyday tire changing applications and for operators looking for durability, high performance and productivity; the CP7749 ultra-compact lightweight high power ½” composite impact wrench that delivers one of the best power-to-weight ratios for its class and delivers maximum efficiency in the workshop; and the CP7776 1” metal pneumatic impact wrench that offers high power and durability for general mechanics and tire changing on heavy vehicles. In addition, the company will be previewing its new line of workshop equipment for professional automotive and heavy vehicle maintenance. The highly anticipated new line of workshop equipment includes jack stands, bottle and floor jacks, air-hydraulic jacks and presses, and other accessories. It has functional design, exceptional engineered quality, inherent durability, and high safety levels, meeting ASME standards. For more information and to learn about Chicago Pneumatic’s innovative solutions for the vehicle service market visit booth 10102 at SEMA or go to www.cp.com.